"SS Woniora was discovered by Max Gleeson and John Riley"
On 20 January 1955 a vessel called MV Konanda was launched from the D & J Boot shipyard in Aphen, River Rhine, The Netherlands. The ship was built for the Adelaide Steamship Company. The new ship was 153.25 feet (51 metres) long and 29.91 feet (9 metres) wide with a depth of 8.91 feet (3 metres). It had a tonnage of 414 gross (145 net) and was registered with Lloyds as 1196736. The ship was put into service carrying raw sugar between Cairns and Mourilyan and Goondi in Queensland. These last two places are located at Innisfail, also in Far North Queensland. I assume that she carried sugar from Mourilyan and Goondi to Cairns where it was on-shipped. In 1958 the Konanda shipped the final load of bagged sugar from Port Douglas. After this date the cargo was sent by road to the Cairns Bulk Sugar Terminal. In 1961 the MV Konanda was sold to Pearl Kasper Shipping of Nelson in New Zealand. Nelson is on the northern tip of the South Island and it was to be used as a ferry between Nelson and the capital, Wellington, which is on the southern end of the North Island. This means that it was used to cross Cook Strait, one of the most adverse waterways in the World (I crossed it in late 2000 and we had 8 metre swells). Apparently the ship was withdrawn from service suddenly as in the Volume 19 Number 1 of 1967 issue of the New Zealand Marine News it was reported that mystery surrounds the departure of the 415 ton Dutch built coaster Konanda. It was reported that it left Nelson on 10 December 1966. The article did not solve the mystery appears to have also described the vessel and its history on the Nelson-Wellington route. I have not seen the article yet. Its replacement was the Towai. In any case, it had been sold to Captain Athol Rusden of Port Vila, New Hebrides (now Vanuatu). It was reported that it was to be used in "the Islands". This may mean around Vanuatu or other South Pacific Islands. A later report in the same journal says that the Konanda had been used in the general cargo trade between Noumea in New Caledonia and Wallis Island. It was reported that it was possible that she may join the former MV Holmbrae on geophysical work in Bass Strait. In 1966 the Holmbrae was also purchased by Captain Rudsen and renamed MV Paul Markson (also reported as Paulmarkson). It appears he also purchased the Holmrea from Holm Shipping. On 7 August 1966 the Paul Markson was sent to Bass Strait (between Tasmania and Victoria) for geophysical work, presumably on the then developing Bass Strait oil fields. Sometime after this she moved to Port Vila. For the next three years or so it was used around the islands of Vanuatu until sometime in 1969 when it was sold to Comptoirs Francais des Nouvelles-Hebrides, also of Port Vila and renamed MV Henri Bonneaud. The Henri Bonneaud is now a dive site in Espiritu Santo. 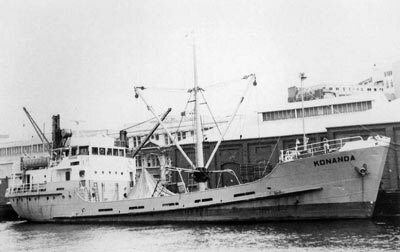 The Konanda was later sold to Burns Philp Vanuatu Limited. When the rebellion occurred on Santo in May 1980, the ship was used to evacuate refugees from Santo. It is stated that on the night of 30 May 1980, a large number of the residents of Santo fled and went to Tangoa Point at South Santo. 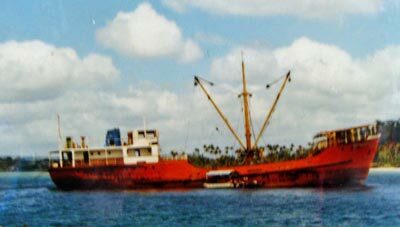 Over 7 to 8 February 1987 she was wrecked by Cyclone Uma and declared a total loss. I arrived in Port Vila a couple of days after this event and the place was a shambles. There was damage everywhere and boats aground all over the harbour. The vessel was later sold to Iririki Island Resort to be stripped and sunk. In the early or mid 1980s, Iririki Island Resort asked a dive company operating out of Port Douglas called Coral Sea Diving Services to run their dive operations. 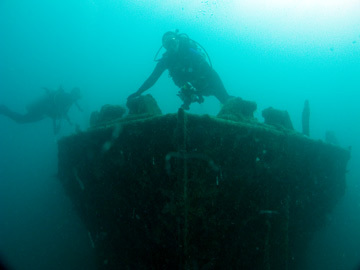 After the Konanda was wrecked, it was Coral Sea Diving Services who suggested to Iririki that they purchase the ship with the view of sinking it as a dive site. 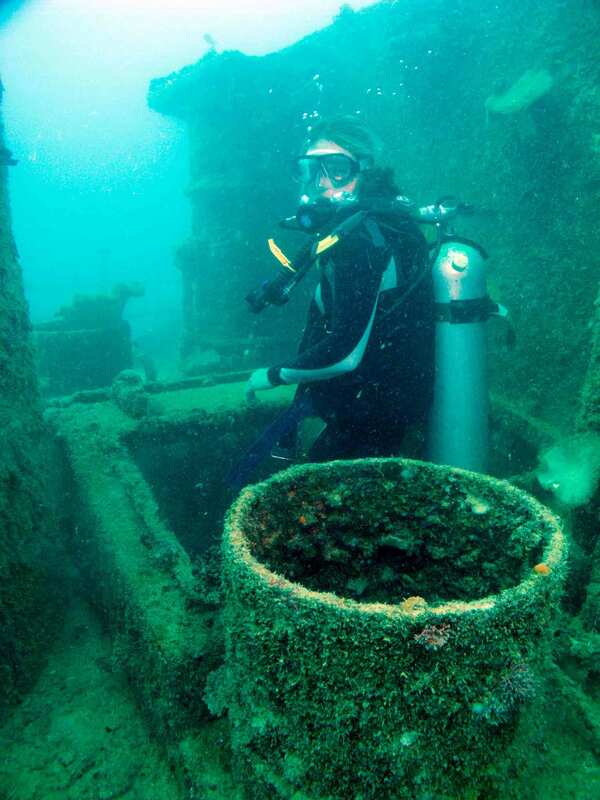 In November 1987, Paul Gaddes was the senior partner in Coral Sea Diving Services. 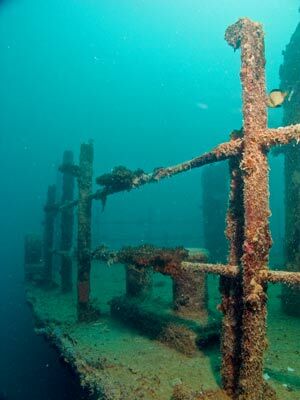 As he was a commercial oilfield diver, he was asked to go over to Port Vila and undertake the scuttling of the wreck. 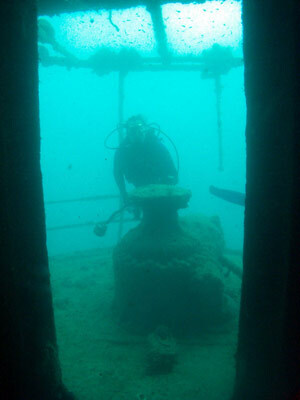 The ship was successfully sunk by Paul and became a favourite with visiting divers. Hopefully I will have some photos of the sinking soon. The Australian pilot strike of 1989 (started in August and went into 1990) not only affected internal Australian flights, it affected flights to other countries. The tourism industry in places like Vanuatu was greatly affected as at that time. Coral Sea Diving Services was forced to stop running the dive operation as a result of the strike. As mentioned, in November 1987 the Konanda was scuttled off Ifira Island. This is the island to the west of Iririki Island and is the southern headland of Port Vila Harbour. The wreck is approximately off the small gap between the island and the mainland. 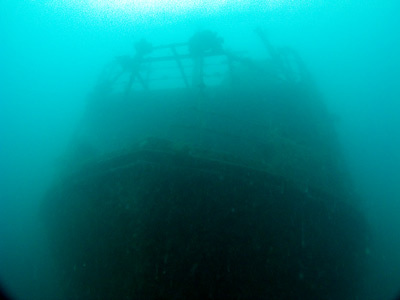 Today the wreck of the MV Konanda sits at about 26 metres with a mooring located on the top of the mast in about 12 metres. A GPS reading of S17° 45' 09.9" E168° 17' 17.5" using WGS84 as a datum will put you on the wreck. Note that there is a very shallow reef located to the north-west of the wreck, it is only one metre on the top so be careful. The wreck faces south. From the mast, head to the bow and you will see that this is quite an attractive photo opportunity. There is a nice bow winch as well. Behind the bow there are two holds. Inside there are portholes, unusual, but remember that this at one time was a ferry on the Nelson to Wellington run. Drop down into the front hold and you can swim through into the second hold. At the end you can swim up through a hatch to the deck level. Go through the starboard door and you enter a large cabin. You can go across to the port side. This goes past the entrance to the engine room, but it is a bit tight and I would only go there after a couple of dives here. Once out the port door, drop over the side and head to the stern. 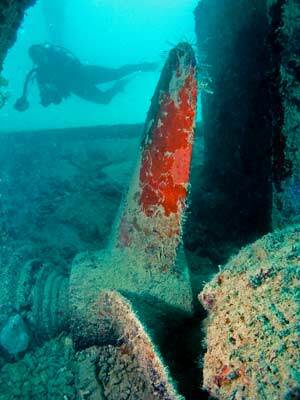 Here you will reach 26 metres and there are some great photos of the propeller and rudder available. The rudder is hard starboard. Once you have examined the prop and stern, go up to the main deck again. There are some nice railings here (also at the bow) and they again make for a great photograph. At the stern there is a huge capstan and in front of that there is a door. This is narrow and inside there is a toilet in the second room on the left. On the right there is the galley and further ahead you come to the engine room again. You can exit up through the engine room skylights here. Behind you is the funnel and an access hatch. Forward is the bridge. From here, go to the bridge and then ascend up the mast and the mooring. Note that if you swim at 290° from the stern of the wreck you will come to the nearby reef and you can end your dive here. It is only a couple of minutes swim. This mooring is located at S17° 45' 07.5" E168° 17' 13.4". 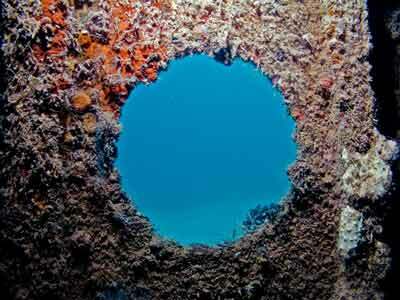 This is a very good dive, well worth doing at least once on a trip to Port Vila. 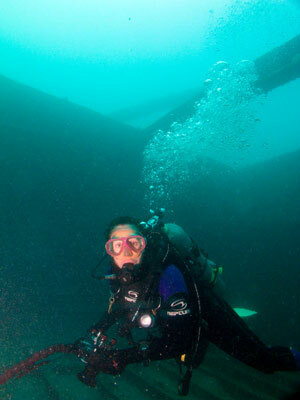 Visibility was about 20 metres and the water temperature 26 to 28° in May.